Saint Louis is obsessed with Gooey Butter Cake (and knowing where you went to high school - odd). I like the cake. It's really good but the consistency is a little too gooey for boring Grace. Enter the cookie version which is the perfect less-goo-but-still-good solution. I know they look pretty ho-hum-glum but they are ho-hum-not. They are kind of like lemon bars sans lemon and with lots of butter. I'm not helping their case. Just trust me. I finally made Sebastian hide them from me last night before I ate all two dozen of my crop. He obliged and promptly hid them in his teeny tiny stomach like the obedient child that he is. in case you need a visual. Our oven is pretty hot and I baked them for 11 minutes which was perfect. It is MUCH better to under cook these babies than over cook them so be conservative - be - be - conservative. Okay. Wait until they are somewhat cooled before shoveling them off the sheet and into your mouth because the goo needs to settle. 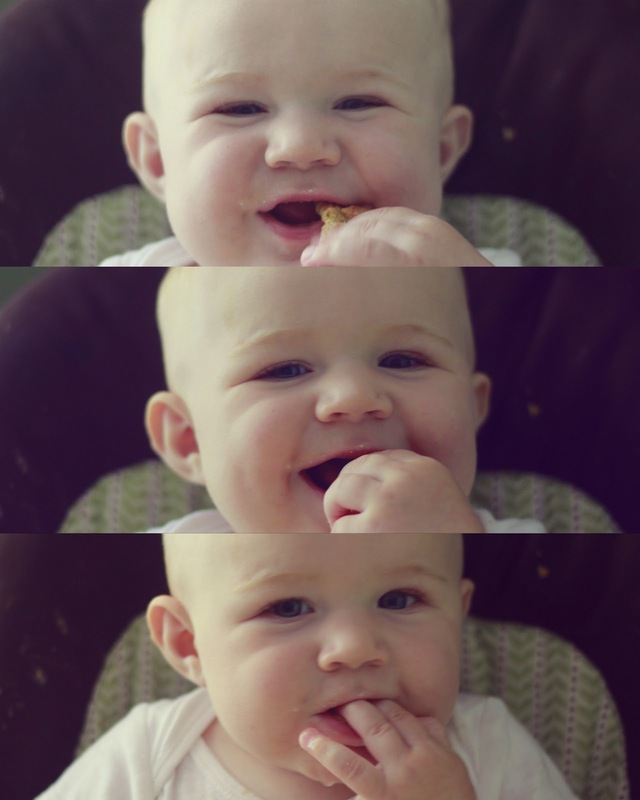 And then try and beat his 30 second cookie devouring record using only two teeth and one left hand. Let me know when you do or we'll risk unhealthily bloating his pride and ego which would be no good. And now for the fun. Do you have a recipe anywhere on your blog? I don't care if it's for better Gooey Butter Cookies or pasta boiled in milk instead of water (smartest ever - btw) or Thanksgiving turkey but I'd love it if you left the link below. I thoroughly enjoyed reading all of your inaugural blog posts and now I need some creative help in the kitchen. I assure you I'm already indebted to your kindness as I'm stuck in a three meal rut. Thanks a zill. Why do you do this to me? Why? Now I ave no choice but to take all six of the savages to the store just for some stinking cream cheese because I am now seriously craving these cookies. Ooh love this idea for a link up! I'm including a recipe I made last year that I've been craving to make again! Um, this was a fab idea, and one that may just kill me- especially these cookies which I plan on making asap. Yum! I'm linking to a recipe for my favorite soup, because who doesn't want to make soup when it's 95 degrees outside? It's a good one for a rainy day! Cincinnati does the high school thing, too. V. mysterious. People say, "Where did you go to school." And if you say, "University of Kentucky" they will dismissively say, "No, no, HIGH school." ??? No comprendo. Oh, bother, messed the link up. I'm new to linking. Anyway, I made a raspberry ginger cake last week. Yesterday I made a panful of a Nigella Lawson idea- chocolate softened with a little butter, poured over salted peanuts and crushed sponge toffee bars. Low calorie nutitious snacks, tht's me. All typos are because of typing lefthanded while nursing. So, I'm officially obsessed/addicted (You pick the less creepy word) to you and your blog. Maybe I should have just said blog. I am not much of a reader of things so cootoes to you. Fo reals. I just love it. These look amazing! I will, however, have to refrain from making them. It's just me in this house, and if I make them, I will eat them. All of them. I'll have to check out some of the other recipes as well! You can never go wrong with lots of butter. ;) The ONLY recipe on my blog is for the best black bean soup ever! Too bad it's summer. Tuck it away, it's great for Fall parties. I bet if you chilled the dough it would roll nicely. I'd love to make these but I made that panful of chocolate crack yesterday, it's forty degrees celcius out (that's, um, 102F), and I'm not packing up my sleep-deprived self, the twins, and my psychotic older boys and going to the store. We don't have a car. I am not walking anywhere. Instead we will stay home and I will make popcorn while they watch endless movies. Ryan's family is from Missouri, so we have Gooey Butter Coffeecake at all the major functions. (Although, they call it "Chess Cheesecake," which is just strange, so strange. But, not strange enough to prevent me from eating half a pan at the latest reunion a few weeks ago.) But, I like cookies more than cake, so I think I may be going to store today to get the ingredients for these. Gracias. Well these look awfully good (and easy). Maybe too easy to eat though, so I'd perhaps better avoid making them as I don't have my own adorable eating helper. In any case, I shared above my latest favorite dinner recipe, which I deem healthy enough to make up for cookies and desserts (because I've also shared my recent favorite of those...). Fun idea to collect recipe posts! I've never even heard of such a thing. But I clearly must try them. Cookies are my favorite. I can't decide which look more scrumptious: the cookies or Sebastian's cheeks. Nom nom nom. Yum! Wish I had more time to bake. Just realized I misread your last post! I thought you said you were potty training Julia and she was having accidents. Lol! I'm guilty of reading off my phone while nursing :0 So embarrassed! Oh, the high school thing - it's to see which neighborhood you grew up in. Are you classy or trash? Nice, eh? On a more pleasant note, those cookies look amazing, and I'm now going to desperately try to erase all memory of them from my brain lest I snap one day in the midst of a sugar craving and make and eat an entire batch. Just the fact that they have cream cheese in them makes me want to devour them! for quick and easy dinners! Good luck! These cookies sound crazy good! I think I'll make them on a day that I decide to cheat from my dairy-free ways. I haven't linked it yet, just warning you in advance: my only recipe is for bread machine bread. Because I am just. that. boring. p.s. Tommy is demanding I make these cookies. How about I make a baby and HE makes the cookies? As a St. Louis girl I am ecstatic about these cookies! I make my gooey butter cake with half the sugar and do little cupcakes and it is delicious...so these are on the list!! Thank you! Guurl...I linked you up to every recipe on ma blog. Enjoy looking through past (read: awk) posts. May I suggest that you try the tomato soup and the apple pie sauce? They are wonderful this evening. And, for the youngins, I have a wonderful baby food pasta. Good for the young and young at heart. I love that you are doing linkies now. So fun. And also I am dying to try one of these cookies. Just one though cause this summer has not been kind to mah bellay. So. much. junk food. Anyway, we had super delicious mango salsa chicken tacos for dinner tonight. I should blog that recipe. Thanks for the reminder. My family LOVE Gooey Butter Cake so I know these will be quite delish! Thanks for sharing! Considering I bake something extravagant at least once a week for Bible Study or my co-workers or just because I need.chocolate.NOW., I am *shocked* that I only have one recipe actually posted on my blog... I'll work on that. Hope you enjoy reading all the recipes you get! I will have to try these butter cookies mmmm. do i, or do i not, text mr g., who is at the store buying my womanly items, a grocery list of the before mentioned necessities to make my second batch of these little devil cookies? Before the days of Pinterest I started a recipe blog. Enjoy. Haha-yes, which high school you went to is very important. I think it's weird, yet find myself asking that very question anytime I meet someone from St. Louis. Yummy... Totally trying these! (I'm a total baking wimp so this is perfect.) oh and I obnoxiously added 3 recipe posts. Oops. Those seem delicious. I'm not baking much these days. And all of my recipes are links to Pinterest. I have nothing to share- no cute recipe pictures, nothing. I mean, I have recipes, but no convincing pictures that the food is edible. So I have to pass on this linkup but I will be reading all those that link here because YAY! New recipes!